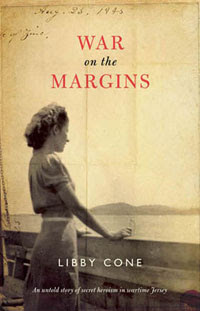 When Libby Cone mailed me about reviewing her book War on the Margins and told me that it was a prequel of sorts to the Guernsey Literary and Potato peel society, I wanted to get my hands on the book.Her mail also told me that I would like the book if I had liked the Guernsey book. I expected a saccharine sweet account of the war and was pleasantly surprised with the way Libby has tackled the subject. France has fallen to the Nazis.Britain is under siege.As BBC bulletins grow bleak,residents of Jersey expect invasion and begin to abandon their homes.When the Germans take over,they bring Nazi racial doctrine with them and the handful of Jews left on the island are forced to relinquish their livelihoods. Marlene Zimmer, a shy clerk at the aliens office, tries to conceal her Jewish ancestry but is forced to flee, and transforms herself into a resistance member under the protection of female artists and lovers, Claude Cahun and Marcel Moore. The book spans five years (1940-45) and chronicles the lives of a bunch of residents of Jersey during the Nazi upsurgence. The narrative is interspersed with original letters, ordinances and notices that were circulated during the period. Claude Cahun and Marcel Moore were surrealist artists and propagandists who lived in Jersey during this time period and put up a resistance against the Nazis in their own subversive way by writing anonymous letters. The book talks of the wonderful relationship between the two artists and their efforts at undermining the Germans. Libby has drawn on the experiences of several Britons and her research that she did for her MA in Jewish studies to write this book. Narrated from several viewpoints, the book is a gritty tale of the difficulties that normal civilians and Jews faced during the war.I don’t think I will ever take a piece of soap or a bar of chocolate for granted ever again ,now that I’ve read of how these were a luxury during the days of the war and that average civilian meals consisted of scraps of potato bread and pieces of wrinkled swedes. The narrative did seem a little choppy at times with the narrative switching between viewpoints of Marlene;the surrealist Artists; Peter,a prisoner and Mrs Erica Richardson, another inhabitant of the island.However,I must confess that I liked the book immensely. I found the parts where Peter and his comrades are tortured by the Nazis and description of the sub-human conditions under which they lived heart-wrenching. It just made me wonder about the amount of hatred Hitler had stored up inside him to inflict such horror on fellow humans.I am not sure if any character stood out enough for me to like him/her more than the other,but all of them served their purpose of furthering the story. The book is cleverly written and is full of examples of bravery shown by normal people.When,at the end of the book the war ended and people could walk out in broad daylight and buy a loaf of bread ,I almost cheered.As you read about the BBC radios spewing music to kindle hope in people or about the planes roaring overhead,you’ll be transported back in time to a world that not only brimmed with hatred(thanks to the Nazis) ,but also with hope and bravery.The letters that the surrealists wrote to each other while in prison appear here for the first time.Love the cover! Thanks to Libby for sending me this book to review.Looking forward to your next book now. Overall, I liked the book, despite the choppiness. Libby Cone’s book is an intimate account of the war that lovers of historical fiction will enjoy.I am not very sure if people who liked Potato peel book will like this as War on the Margins is most definitely more real with real people.3.5/5 from me for the book. The book is available on Amazon.Click here to access the Amazon page. They also have a Kindle version. The imported edition is available on Flipkart.